The best decking material in the world... Perfect for the garden state. 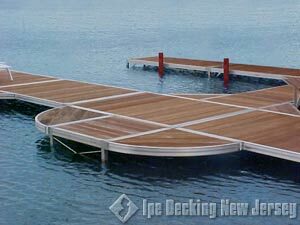 Picture of Ipe Dock on the New Jersey Shoreline - Ipe is the perfect material for building a dock because of its resistance to rot and decay. Ipe offers durability & strength along with great, one of a kind looks. IPE, PRONOUNCED "ee-pay", is an impressive looking tree that grows mainly in Brazil but is found throughout Central and South America and some of the Lesser Antilles. Ipe is just one of many Commercial names used for identifying the various species of Tabebuia. Other common commercial names are: Pau D'Arco, Ipe Tabaco, Yellow Poui, Bethabara, and Ironwood®. New Jersey Ipe Decking has a wide range of uses… It is Ideal for bridges, naval construction, and dock work, exterior construction, etc. It is also used for turning, factory flooring, tool handles, archery bows, walking sticks, fishing rods, cabinet work, and veneers. It is considered by many to be the best choice for decking material in the world. Ipe is an extremely dense, tight grained wood. This makes it an ideal decking material because the tight grain makes Ipe a very durable long-lasting material. It also requires little or no maintenance and keeps its shape while being resistant to termites and other parasites. Ipe Decking is generally a deep rich brown with some pieces displaying red and amber hues. The looks of Ipe really distinguish itself from the competition. The deep brown color of Ipe will give any deck a look that can not be matched by any other decking material. Ipe deck boards will naturally turn a silvery gray, much like teak. If a Ipe deck owner wants to maintain the dark, rich brown color then a U.V. inhibitor needs to be applied periodically to the deck surface. This application is not required and is only needed to maintain the color of the decking material. The silvering of the deck will not affect the physical properties of the decking in anyway. Even as the color changes the great physical properties of the wood will remain true and the wood will maintain its strength and durability. Ipe is prized for its stability, durability, strength and natural resistance to decay with absolutely no chemicals or preservatives. Ipe is perfect for use in wet conditions, and is naturally resistant to infestation by termites and borers. Our Ipe is available in long lengths and is completely clear grade material. Ipe is sometimes called Iron Wood which is the perfect name for it since it has a Class A fire rating, the same rating given to concrete and steel. We are direct importers of Ipe Decking. This means that we can save you $$$ on your next deck project. It dosen't matter if you are a home owner looking to add an outdoor living area to your home or a professional deck builder. We ship Direct to your home or jobsite throughout the state of New Jersey. Click HERE to see our Ipe Decking Price List. Why is New Jersey the perfect place for Ipe Decking? New Jersey has some of the harshest environmental conditions, which makes Ipe the perfect decking choice. Click HERE to find out more about Ipe Decking and its ideal properites that make it the perfect decking material.